MANAGUA, Jun 4 2015 (IPS) - Nicaragua, the Central American country with the most abundant water sources, and where water – “agua” in Spanish – is even part of its name, is suffering one of its worst water crises in half a century, fuelled by climate change, deforestation and erosion. María Esther González is one of many residents of the Nicaraguan capital whose daily lives are affected by the water shortages. She lives in a poor neighbourhood in Managua’s District One, where piped water is now available for less than two hours a day. González, the head of her household, hasn’t slept well for the past four years, because she has to be alert and ready when the water starts to run, any time between 11 PM and 3 AM. She then has two hours or less to fill up a number of containers, wash clothes and clean her small home, before the pipes run dry again. “For four years I’ve had to keep a vigil late at night to collect the water for our daily needs,” González told IPS. But sometimes three days go by before the water runs, and Nicaragua’s water and sanitation utility, the Empresa Nicaragüense Acueductos y Alcantarillados (Enacal), has to distribute water in tanker trucks to many neighourhoods in the capital. In Managua – whose name also contains the word “agua” -, a city of 1.6 million people, the problem is more visible due to media coverage of the frequent protests by entire neighbourhoods taking to the streets. But the shortage is a nationwide problem, and threatens the living conditions of the country’s 6.1 million inhabitants, and especially the rural population. Arístides Álvarez, a member of the non-governmental network of Potable Water and Sanitation Committees, told IPS that in rural areas in central and western Nicaragua thousands of families used to depend on wells and rivers that have dried up. The community organiser said, for example, that in some communities in the department or province of Chinandega, 140 km northwest of Managua, three rivers that supplied at least 1,300 rural families now run dry during the November to May dry season. According to Álvarez, rural families were desperately waiting for the rains that should fall in the May to October rainy season. But this May the rain was scant and sporadic. Ruth Selma Herrera, the former executive president of the Enacal water facility, told IPS that another problem affecting water supplies is the lack of investment in the water system and poor water management. “At least 150 million dollars are needed to upgrade the water distribution network, because the pipes are old and the losses due to leaks are enormous,” she said. But no short-term solution is in sight. According to forecasts from mid-May by the U.S. National Weather Service’s Climate Prediction Center, there is a 90 percent chance that the El Niño climate phenomenon will continue to affect Central America through the Northern Hemisphere summer and an 80 percent chance that it will last through the year. El Niño/Southern Oscillation (ENSO) is a cyclical phenomenon in which the surface temperatures of the equatorial Pacific rise and have repercussions on weather around the world as the currents flow west to east. 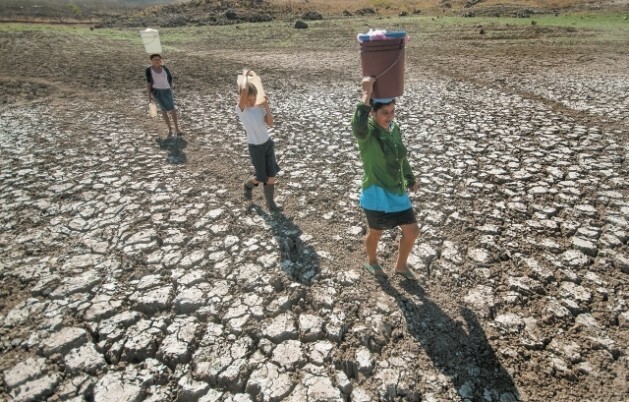 In response to warnings of a new drought, the Nicaraguan Foundation for Economic and Social Development sounded the alert about food and nutritional problems for the people living in the so-called “dry corridor” – an arid region in the northeast and centre of Nicaragua encompassing 33 of the country’s 153 municipalities, characterised by low rainfall and high poverty levels. The concern, expressed in a report on the country’s economic situation for 2015 presented in April, is that in the dry corridor, home to over one million people, food production and consumption could decline again due to the drought-related loss of grains and livestock, similar to what happened last year. In 2014 the central government sent emergency aid – food, water and medicine – to that area affected by the drought caused by El Niño, which periodically leads to drought on the western Pacific seaboard and the centre of the country, with a major drop in precipitation during the rainy season, according to the Centro Humboldt, a local environmental organisation. The organisation’s concern was shared by the local World Bank delegation. World Bank representative in Nicaragua Luis Constantino told the La Prensa newspaper that the Bank and the government were currently discussing a strategic plan for the dry corridor. Jaime Incer Barquero, a Nicaraguan scientist and adviser to the president on environmental issues, told IPS that climate change has been expressed in Nicaragua through the El Niño and La Niña effects, associated with drought and flooding, respectively. This country has Central America’s two biggest lakes: the 1,052-sq-km Lake Xolotlán and the 8,138-sq-km Lake Cocibolca, also known as Lake Nicaragua. In addition it has 26 lagoons, over 100 rivers, four reservoirs and five of Central America’s 19 largest river basins. Different organisations say the level of soil erosion in Nicaragua is 10 times higher than the maximum rate that permits an optimum level of crop productivity, and this is affecting the country’s water sources. The International Center for Tropical Agriculture (CIAT) reported that Nicaragua’s soil is eroding at an irreversible pace because of the conversion of forest to pasture land for extensive grazing. The maximum tolerable soil loss in the country is four tons (degraded due to poor agricultural and livestock management practices) per hectare per year. But in Nicaragua soil loss stands at 40 tons a year, CIAT researcher Carlos Zelaya explained during environmental workshops held in Managua in May. The United Nations Food and Agriculture Organisation (FAO) confirmed the magnitude of the problem. “In Nicaragua land degradation is around 30 percent, and as high as 35 percent in the west,” said FAO food security facilitator in Nicaragua, Luis Mejía. I am very sad to read this story.Living in Costa Rica ,I have learned the value of trees on a mountain that hold water in the earth.I own a 74 acre farm which is really a mountain most of it is covered in trees. Because of them I have three year round springs that provide all the water I could ever need.If those trees were cut,I would lose those springs and my farm would be worth nothing.